Not to be confused with Building model or Software architectural model. 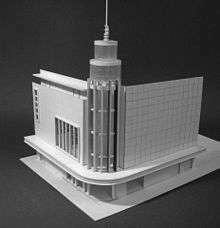 An architectural model is a type of a scale model - a physical representation of a structure - built to study aspects of an architectural design or to communicate design ideas. Depending upon the purpose, models can be made from a variety of materials, including blocks, paper, and wood, and at a variety of scales. Architecture is the art of designing buildings. 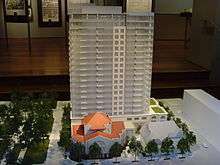 Architectural models are used by architects for a range of purposes. Ad hoc models are sometimes made to study the interaction of volumes, or to get an idea of how they look from different angles and to explore ideas. They can be used to exhibit and sell a design to help visualise a design. A model may be useful in explaining a complicated or unusual design to the building team, or as a focus for discussion between the design teams such as architects, engineers and town planners. Models are also used as show pieces, for instance as a feature in the reception of a building, or as part of a museum exhibition such as scale replicas of historical buildings. Landscaping design models are models of landscape design and development representing features such as walkways, small bridges, pergolas, vegetation patterns and beautification. Landscaping design models usually represent public spaces and may, in some cases, include buildings as well. Urban models are models typically built at a much smaller scale (starting from 1:500 and less, 1:700, 1:1000, 1:1200, 1:2000, 1:20 000), representing several city blocks, even a whole town or village, large resort, campus, industrial facility, military base and so on. Urban models are a vital tool for town/city planning and development. Urban models of large urban areas are displayed at museums such as the Shanghai Urban Planning Exhibition Center, Queens Museum in New York, the Beijing Planning Exhibition Hall, and the Singapore City Gallery. 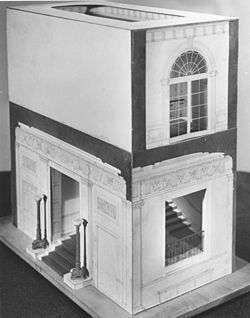 A model by architect Lorenzo Winslow which he used to explore the structure of the Grand Staircase at the White House for his redesign of the East Wing. 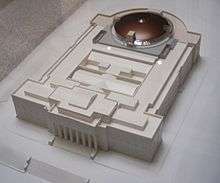 Model of a museum building. Model of a building interior. Buildings are increasingly designed in software with CAD (computer-aided design) systems. Early virtual modeling involved the fixing of arbitrary lines and points in virtual space, mainly to produce technical drawings. Modern packages include advanced features such as databases of components, automated engineering calculations, visual fly-throughs, dynamic reflections, and accurate textures and colours. Rough study models can be made quickly using cardboard, wooden blocks, polystyrene, foam, foam boards and other materials. Such models are an efficient design tool for three-dimensional understanding of a structure, space or form, used by architects, interior designers and exhibit designers. Common materials used for centuries in architectural model building were card stock, balsa wood, basswood and other woods. Modern professional architectural model builders are taking advantage of twenty-first century materials, such as Taskboard (a flexible and lightweight wood/fiber board), plastics, wooden and wooden-plastic composites, foams, foam board and urethane compounds. Cubes are commonly used, stacked upon one another, to build up an architectural model. A number of companies produce ready-made pieces for structural components (e.g. girders, beams), siding, furniture, figures (people), vehicles, trees, bushes and other features which are found in the models. Features such as vehicles, people figurines, trees, street lights and other are called "scenery elements" and serve not only to beautify the model, but also to help the observer to obtain a correct feel of scale and proportions represented by the model. Increasingly, rapid prototyping and solid freeform fabrication ('3D printing') are used to automatically construct models straight from CAD plans. The challenge with using these tools lies in the CAD file format. The majority of 3D printers accept the stereolithography (.STL for short) file format, which is basically a mesh that wraps around the object in 3-dimensions. It helps to visualize this as a bag of oranges wrapped in a mesh bag. If there is a "tear" in the bag, the oranges will spill out. This is similar to what happens when an STL file is not cleanly produced and prematurely sent to a 3D printer. Clean STL files are a major challenge for architecture models produced using this technology. Other rapid prototyping technology, also CAD based, which become very useful for architectural model making is CNC carving. Large CNC carving plotters are able to carve out of high density foam boards up to 10' x 4' topography for architectural or urban model. A model of two residential towers, made of earthenware during the Han Dynasty in China. Paper architectural models of a bungalow, office and house. Architectural models are being constructed at much smaller scale than their 1:1 counterpart. Sometimes model railroad scales such as 1:160 and 1:87 are used due to ready availability of commercial figures, vehicles and trees in those scales, and models of large buildings are most often built in approximately that range of scales due to size considerations. ↑ "What is Architectural Visualisation?". Flying 3D. Retrieved 18 June 2015. ↑ "What is Accurate Visual Representation?". Flying 3D. Retrieved 18 June 2015. ↑ Gibson, Ian; Kvan, Thomas & Ming, Ling Wai. Rapid prototyping for architectural models (PDF) - University of Hong Kong, Rapid Prototyping, Volume 8, Number 2, 2002, pp. 91–99. ↑ Architecture Models: Using 3D Printing in the Desigh Process, Sweet Onion Creations LLC 2007. Wikimedia Commons has media related to Architectural models.